Dane Rudhyar, one of the pioneers of modern astrology, has said “The moment of an individuals birth marks our entry – physically and symbolically – into the cosmos”. With this in mind, the cosmic birth mark of the 18th National Kinesiology Conference heralds a powerful rite of passage for the future direction of kinesiology. The call to ‘Embrace the Spirit of Kinesiology’ is an invitation to claim the visionary qualities inherent in our work. The healing core of kinesiology is about connection: our connection to each other; to our hearts/mind/body/soul/spirit; to something greater than ourselves; to the planet we live on. We are the link between heaven and earth. Working with energy, frequency and vibration as we do, we aim to re-connect the subtle (and not so subtle) threads back to Wholeness and the Source. Colin Wilson says, “The world inside man – down here on earth – corresponds to the world up there in the heavens”, and as a kinesiologist, it is very exciting to work with planetary energy in the form of Astrology because it based on the same principles as the Laws of Five Elements: the microcosm and the macrocosm – that which is mirrored outside us is also mirrored inside us. 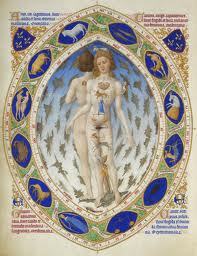 Astrology is the working practice of the Universal Law of “As Above, So Below”. It connects the celestial orbits of planets to the moment of birth here on earth, and puts us in context with the rest of the universe. And so in our role as healers and seekers of ‘connection’, we are co-creators, “weaving into physical form the web that we see and feel reflected from above”. Astrologically, kinesiology is embarking it’s first Saturn Return – when Saturn, the planet of challenge and limitation, completes its 29 year cycle and returns to the place it was when you were born. This is a time of re-evaluation, of learning to stand on your feet separate to the expectations and beliefs of your parents. Since the publication of John Thie’s Touch For Health in 1973, kinesiology has been through its growing pains and reached a dignified adulthood. A generation on, it is now at the gateway of an important crossroad. The choice is ours: Can we take up the challenge posed by Saturn and progress separately from our ‘parents’; or are we destined to repeat the same cycles, behaviours and traditions that have shaped our past? What is the future of kinesiology? How can we prepare and open ourselves to embrace the spirit of kinesiology? An astrological birthchart of the 18th National Conference (see diagram*) reveals we are tipped on a precipice: the Time Is Now, and we are cosmically urged by the movement of the planets and stars to “embrace the spirit” – to work more with intuition, embrace difference, encourage openness and follow spiritual and high minded goals. As kinesiologists, this may challenge the way we earn money or what we believe about healing, but the astrological influence suggests the time is NOW. The first upfront feature of the Conference birthchart is the beautiful Grand Trine – the triangle shape made between the Sun and Mercury in Libra the 11th house, Saturn in Gemini in the 6th house and Uranus in Aquarius in the 3rd house. A Grand Trine is a harmonious feature that represents possibilities, good will and self motivation – an excellent foundation for a conference, especially since the focus is on Mercury, the planet of ideas and communication. Mercury is in the 11 th house which influences group work, concepts, wholeness and progress. When we match the meridians to this birth chart, we see that Mercury and the Sun are expressed through Small Intestine, so the exchange of ideas is influenced by the Small Intestine qualities of discernment and assimilation: take on what is good and pass on what you no longer need. Importantly, Mercury and the Sun share a favourable frequency match with Saturn and Uranus. Saturn is in the 6th house of healing and service to others and is expressed through the fire element meridian Triple Warmer, providing stamina, fuel and a strong core foundation from the past. Uranus is in the 3rd house of teaching, learning and communicating and strongly placed in Aquarius, expressed through the metal element Large Intestine. This can only mean one thing – Out with the old! Let It Go! When fire and metal get together, transmutation and alchemy can happen. Uranus in Aquarius has a rebellious and unconventional influence: sometimes inspirational, sometimes disruptive, but ultimately progressive and concerned for the good of the Whole. It is clearly a healthy time to discuss and exchange ideas, while integrating the new (Uranus) with the old (Saturn). Opposite Uranus is the Moon in Leo, expressed through Kidney in the 9th house. This relationship can create some tension with Uranus’ desire to create shock, upheaval and debate. Emotions could run high, but the Moon in the 9th house is an excellent position for accessing inner knowing, and suggests feelings and intuition will guide our higher learning. We would welcome the opportunity to make new rules if they felt right and addressed our fears. A humbling signal for the future is that Uranus is conjunct the IC, suggesting past life experience and ancient wisdom can become new knowledge in this life time. The Moon is conjunct (ie, very close to) the MC (at the top of the chart, representing vocation and career), so the potential is strong for kinesiology to progress professionally in the realm of feelings and intuition. We will be highly motivated to pursue what feels right. The MC is in Virgo/Bladder, so we are reminded to exercise some control (Bladder), pay attention to detail and adopt the higher minded aspect of Mercury – as the Alchemist. The Leo Moon in Kidney is a very sensitive and feeling-based aspect, wanting creative outlets and some of the limelight. Moon expressed through Kidney has potential to really reach into what is buried deep within, and Leo wants to bring it out in a creative and generous way. Connecting the head and heart may be a battle, but it is the time to make the bridge. Planets in the first house of a birth chart give a good indication of basic motivations, outward expression and temperament. The Conference birth chart has Chiron, the planet of healing, spirituality and wounds in Sagittarius/Spleen in the first house and just 6 degrees from the Ascendant. This is an excellent placement for healing, the expansion of consciousness, teaching and spiritual guidance – but there is a warning not to alienate ourselves or others in the process. It is clear we identify with the archetype of the shamanic healer ready and able to use unconventional means to bring about healing to the highest good… but as always with Chiron, we must experience our own wounds, and they won’t go away. Kinesiology’s wound may have the form of past rivalries and conflict, a sense of being alienated by mainstream health practice or doubtful claims and motivations. With this placement, we are encouraged to maintain integrity and learn from experience. Kinesiology’s wounds as a whole can be healed but it is an ongoing journey – and the time is now to enjoy the process and your participation in it. In the Sagittarian Ascendant, we see the public face of kinesiology. There is a positive aspect between Mercury in Libra/Small Intestine and the Ascendant expressed through Spleen. It signifies great potential to expand and enlighten the “personality” of kinesiology. We will be drawn to higher minded ideas, ethics, exchange and communication – it is what we outwardly desire, and we can be recognised for that. We have a desire to expand our profile and adopt a more spiritual/philosophical path. Sagittarius/Spleen is a very optimistic placement because Spleen is very co-operative, nurturing and social. It circulates sweetness, nutrients and blood – it’s great for networking. In Sagittarius, the focus is on expansion, higher learning, spirituality (and overseas travel). We have a real opportunity to raise our profile internationally. The challenge will be keeping our feet on the ground and not getting caught up in our own lofty aspirations! But to the rescue is the reality check of Pluto, also conjunct the Ascendant, and demanding transformation take place! Pluto is the planet of death/rebirth and transformation. It brings about explosive change and reveals in profound honesty, what has been too hard to see. The position of Pluto in the Conference Chart indicates a big shake up about what we believe of ourselves and how others see us. Pluto is in the 12th house, opposite Saturn in the 6th. This is the same configuration many astrologers look at to explain the explosive and transforming terrorist attacks in the United States in September. Pluto moves opposite Saturn every 34 years and it marks a time when explosive challenges (Pluto) to old authority (Saturn) can bring about major transformation. For kinesiology, we are offered an amazing opportunity to build on the ideas and foundations of our forefathers (Saturn Gem/TW) and absolutely transform (Pluto Sag/Sp) old notions of healing (Saturn in 6th ) in a positive and optimistic way. This presents a powerful challenge to old authority – there may be explosions if Saturn is too rigid. It would seem with Sagittarius/Spleen involved we have a spiritual duty to circulate and nourish – to expand our boundaries and our profile. Some of the difficulties this will bring up are evident in the ‘T Square’, creating tension between Jupiter opposite Mars and the ‘square’ aspects of Jupiter/ Mars/ Mercury and the Sun. New leaders will emerge in our field and there will be plenty of energy and opportunity for kinesiology to progress as a whole. Mars in the second house in Capricorn/Stomach represents a problem sharing resources – especially money. This placement prefers caution and traditional values. Jupiter in Cancer (expressed through Pericardium) is a very protective and mothering placement, but some (especially women) may ‘hide in their shell’ if they are restricted or if change is too bombastic or masculine. Some people may feel stifled, while others won’t be able to digest (Stomach) the new ideas of Mercury and those who have already assimilated them (Small Intestine). Aim to have a spirit of openness if presented with this tension between the old and the new. It will certainly stir up survival issues amongst kinesiologists: stomach is a yang meridian that wants to feel satisfied, so ask honestly what can be done to feed it. Is it a material need, facts and figures, or to listen to intuition more? We are well placed to pursue a beneficial outcome for all, by encouraging openness in the exchange of ideas, harmony (Sun in Libra) and joy (Mercury and Sun in Small Intestine) so that resentment doesn’t build. What does it mean to Embrace the Spirit of Kinesiology? The challenge posed by the AKA Conference organisers brought out some of the best and most positive aspects of working professionally to heal ourselves and others. As healers, we are called upon in the most intimate of circumstances to honour the qualities of respect, integrity, best practice and unity. Kinesiology is a truly innovative, dynamic and diverse field and we owe it to ourselves to keep it creative and of a consistently high standard. Furthermore, there is huge potential for kinesiology to progress if we heal through spirituality and follow higher minded (and even unconventional) goals. At the same time, we are encouraged to pay attention to detail and not sink exclusively into our emotions. The time is now to accept and embrace difference, diversity, and encourage openness and respect for all. We are poised on a cosmic precipice to connect with a higher purpose and embrace the spirit of kinesiology. * Features of the Conference birth chart selected here for comment are not the only significant aspects! I encourage detailed examination of the chart to enable you to draw your own conclusions. No part of this may be reproduced or published in any form without the express permission of the author.